How is F-Response Consultant + Covert different? F-Response Consultant + Covert is the limited covert subject version of F-Response. Simply put this means with F-Response Consultant + Covert edition you may have a single remote covert subject at any given time. In addition, F-Response Consultant + Covert deployment and connectivity was designed to be covert and efficient allowing the investigator to access a single machine covertly and quickly without concern for alerting the end user. I'm a consultant, can I use F-Response Consultant + Covert on site at a client? Yes! F-Response was designed by consultants for consultants. Our licensing allows you to use F-Response while onsite at your client or while connected to them through a virtual private network. Interested in using F-Response Consultant + Covert as part of an inexpensive Managed Services offering? Check out our complete pdf/xps on leveraging F-Response to extend your consulting practice over the Internet. F-Response includes optional examiner installation packages complete with gui tools and scriptable command line components for Linux and Apple OSX. 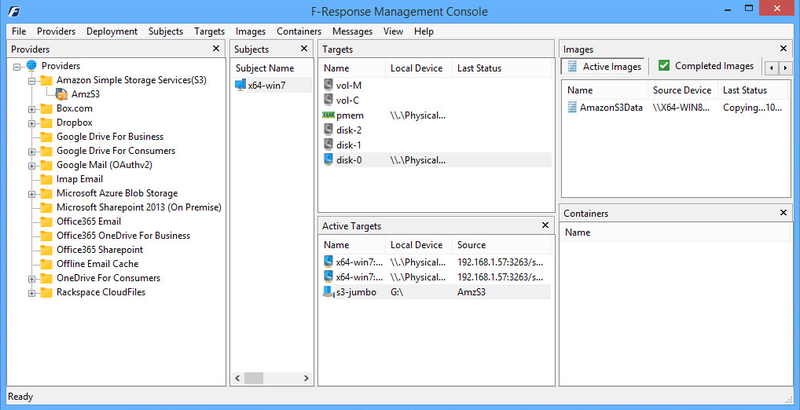 F-Response works with all RAID disks, physical drives, logical volumes, and physical memory (32 & 64 bit Windows). In addition, F-Response Consultant + Covert includes target executables for over ten (10+) operating system environments, including exotic hardware such as IBM AIX and Solaris. Furthermore based on its unique vendor neutral patented design, F-Response works with all Computer Forensics, eDiscovery and Data Recovery software packages, simply put, if your package reads from a hard drive, it will work with F-Response. F-Response includes unlimited installations, connections, and examiners for a period of one or three year(s) from the date of purchase. Software will cease to function at the end of the license duration unless renewed. In addition, F-Response Consultant + Covert includes a license for F-Response Consultant, Field Kit Edition, and allows true many-to-many connectivity from any examiner platform. Interested in trying F-Response Consultant + Covert risk free in your environment? Use this link to contact Sales and arrange a brief GoToMeeting demonstration, after which we can give you direct access to our virtual dongle so you can begin testing F-Response Consultant + Covert in your environment. To Purchase F-Response Consultant + Covert Edition online via credit card go to Purchase F-Response Software or request a quote. We do accept purchase orders following a completed credit application. To request a credit application contact F-Response Sales and Support. If you would prefer to use a local reseller you are welcome to review our list of resellers by country here.